Arbortec Scafell Lite Chainsaw Boots. Keep your eyes peeled for these on our site. Available for delivery in October 2015 as they will come in and go out very, very quickly! The price will be around £178 and they will come in 3 colours, green and 2 to be revealed, one colour is very interesting as I have not seen this before in any type of boot! They are a class 2 but also very light for a chainsaw boot of this class. Leading on from the Scafell XER which again are an excellent boot in my opinion, I had these for over 2 years and still they are going strong, only the want for trying out a different brand has now retired them. 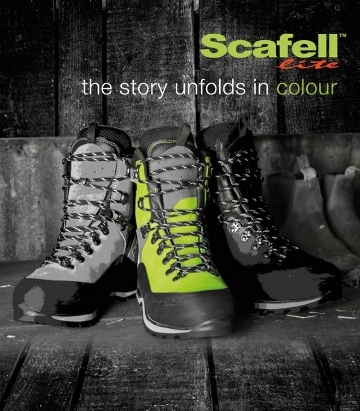 The XER boots are heavy and clompy at first but in time they are comfortable and you get used to the weight, the new Scafell Lite's are a lot lighter with no stitching to come away, we think the climber out there will love them!